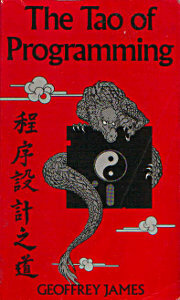 The Tao of Programming by Geoffrey James is a short book of humourous computer parables inspired by an ancient Chinese text, the Tao Te Ching . The Tao Te Ching is believed to have been written 2500 years ago by Lao Tzu and provides the basis for Taoist philosophy. The book is separated into 81 (34) short chapters of parables and proverbs. The preface (not included in the online copy) describes how James, an amateur computer archaeologist, stumbled upon and decoded The Tao of Programming while searching through a stack of obsolete punch cards. Although the book is short and you probably won't learn anything new, it's definitely worth a read if you have 30 minutes to spare.